This is Heater Harbour at dawn taken from the Passing Cloud. 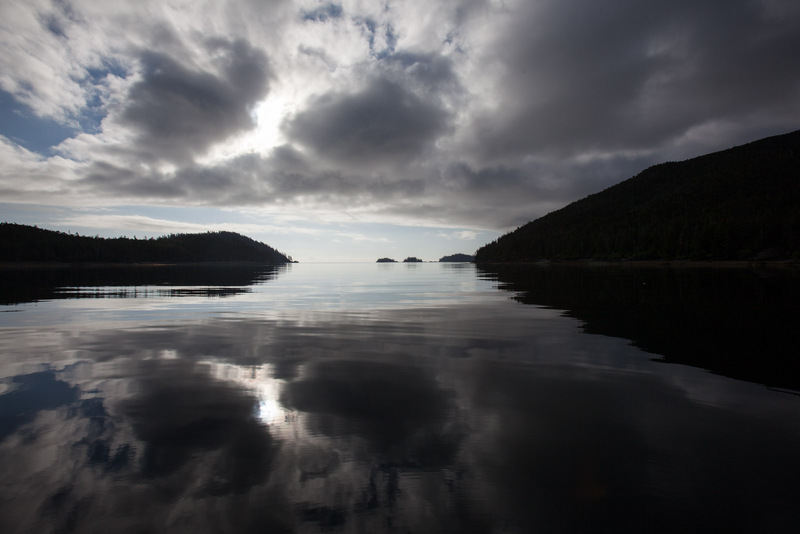 Heater Harbour is on Kunghit Island just east and south of Rose Harbour in Gwaii Haanas. Yes. Or mercury, if you had the experience of free flowing mercury in science class in high school (I bet they don’t let students play with mercury anymore). Very much like the surface of this water. Yes, it looks more like mercury – my brothers and I had an even better experience, because my father brought some home from work one day. Dangerous, I know, but he was very big on safety so I’ll assume he was watching us carefully. I remember the ball it would form into, and I think the weight. All of us older folks will die earlier than we should because we played with mercury! 😉 Cool stuff. Thank you Valerie, there are many mornings like this when anchored in east facing bays.